About six weeks ago I swallowed hard and ponied up the cash for Gary Grigsby's War in the East, and with the Don to the Danube expansion. 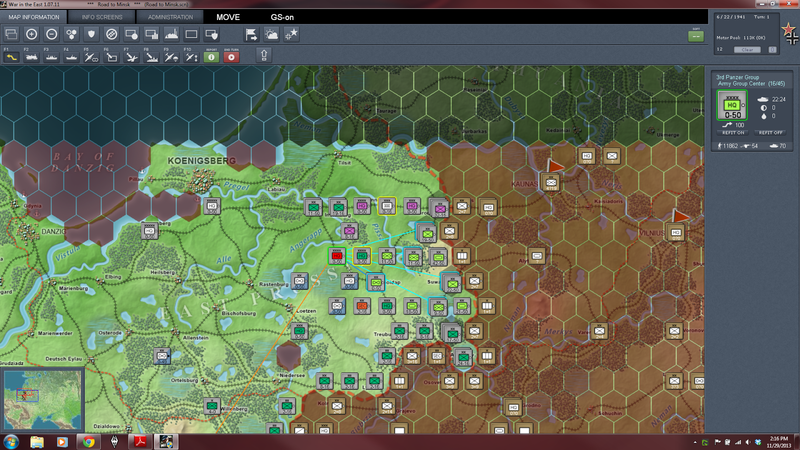 As a simulation of the entire German-Soviet War from 1941 to 1945 at the brigade/division level it rightly has a reputation as a "monster" game. I was concerned that I'd spent a lot of money on a game that would be so complex and dry that I'd never play it. And honestly, other than running through the tutorial once, I've left the game alone for several weeks. However, a couple of days ago I started reading Glantz's Operation Barbarossa: Hitler's Invasion of Russia 1941 (purchased almost a year ago, the last time I was on an Eastern Front kick!) and wanted to get a better grasp for the opening phases of the operation, particularly the operations in Belarus by Army Group Center. 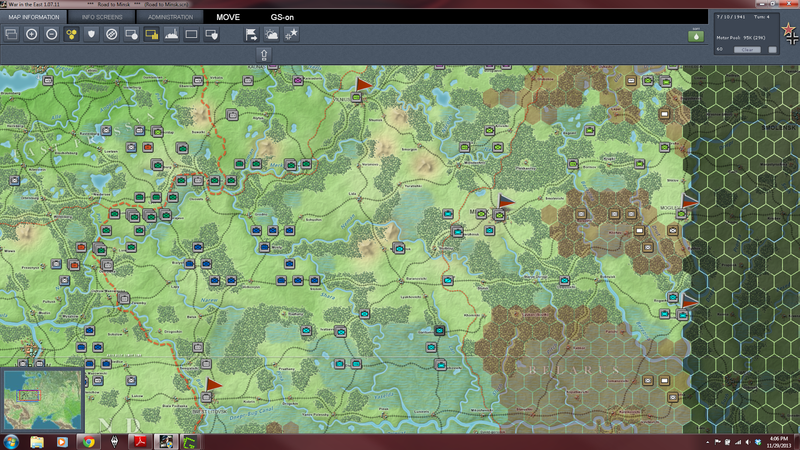 War in the East has a short scenario, "Road to Minsk" that covers the first three weeks of Army Group Center's portion of Barbarossa, which also seemed constrained enough to help me get a basic grasp of the game mechanics. (Note that I am using Jison's MapMod for WitE) The initial situation along the Polish-Soviet border in Army Group Center's sector. The ultimate objective for the Germans, Minsk, is just off the east screen edge. 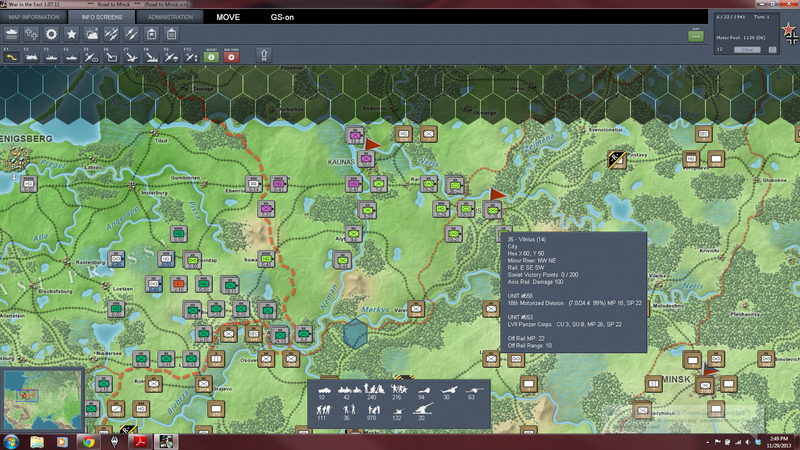 My primary offensive units are 3rd Panzer Group (shown) to the north of the Area of Operations, and 2nd Panzer Group in the south, across the River Bug from Brest Litovsk. The overall plan is to breach the Soviet border forces with the Panzer groups. 3rd Panzer Group will advance through Vilnius and attack Minsk from the north. 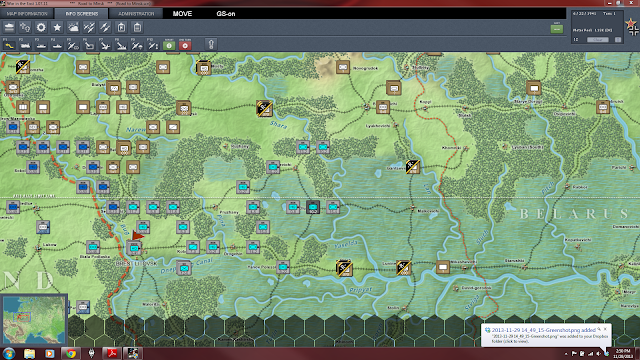 2nd Panzer Group will cross the river, take Brest Litovsk and advance up the rail line to take Minsk from the south. Doing so will encircle most of Pavlov's Western Front. A theater overview at the end of Turn 1. 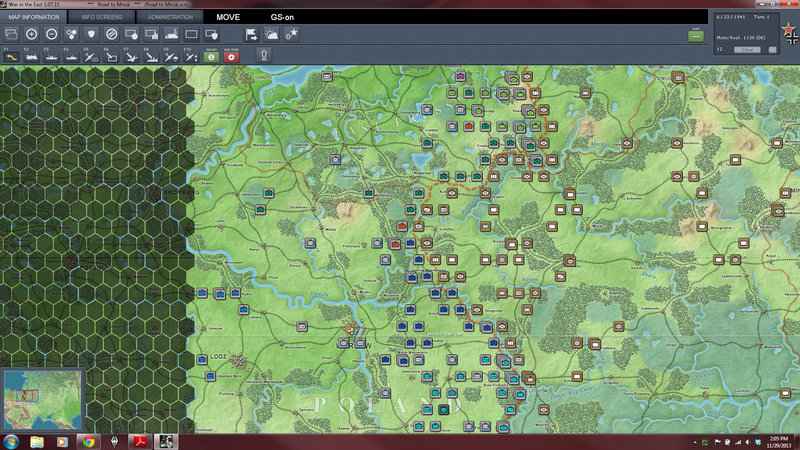 I've left most of the regular infantry units in place close to the border to fix the Soviet formations. 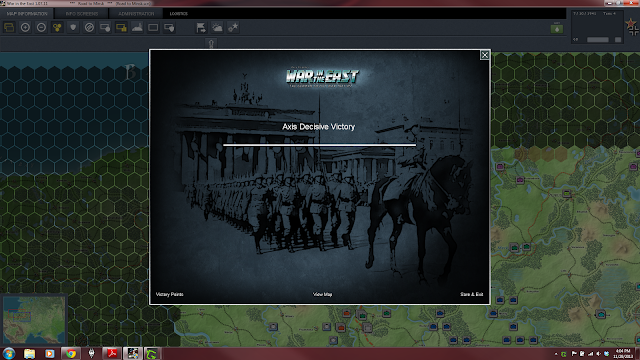 Meanwhile, 2nd and 3rd Panzer Groups have achieved their initial objectives and pushed more than halfway to Minsk. In the north, elements of 3rd Panzer Group have overrun Vilnius. A corps from Army Group North (units with purple NATO symbols) has seized Kaunas to prevent the Soviets from gaining victory points from that objective. In the south 2nd Panzer Group has taken Brest Litovsk and has elements across the Shara River. 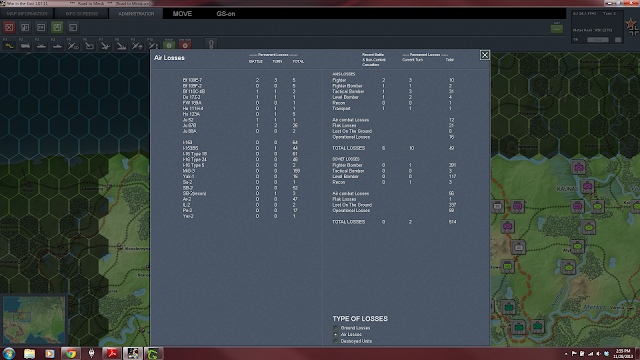 The game has a sophisticated model of the air war that tracks individual aircraft, but is easy to use for the player. My initial bombing strikes at Soviet airfields have taken a heavy toll of Western Front's supporting aircraft while they were still on the ground. At the beginning of turn two, the AI has realized I'm trying to encircle it's forces, and it's moving to try and break them out before it's too late. I was very impressed when I saw the retreat start rather than the AI just leaving units to stand an die in place. Not, frankly, that it's doing them a lot of good. The game also tracks each man and each piece of equipment, and the Soviets are losing plenty of both. In two weeks of combat the units of Pavlov's Western Front have lost 140,000 men. 80,000 of those have been captured. The Soviets have also lost 844 AFVs compared to total German casualties of just over 6800 and 62 AFVs. Blitzkrieg indeed! 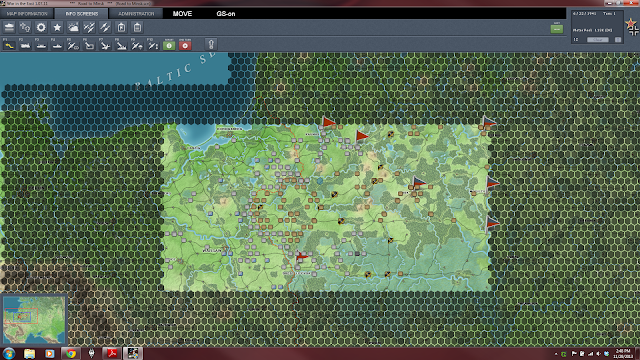 At the beginning of turn 3 the encirclement is complete. The units outlined in red are isolated and out of supply. 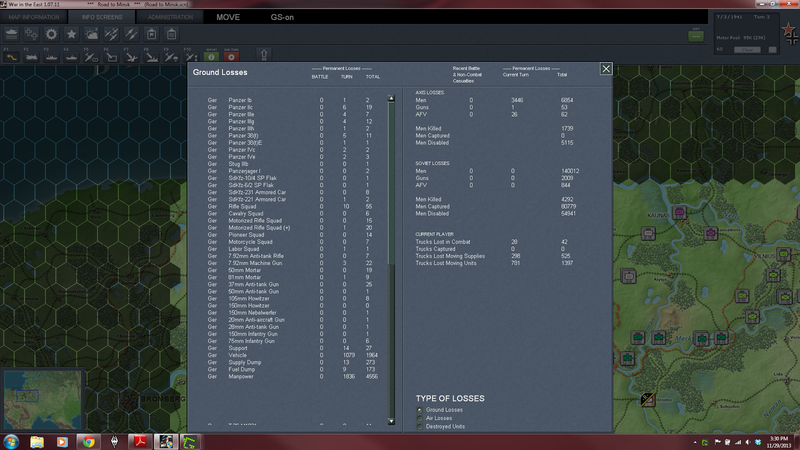 Again, the supply and logistics system in the game is very sophisticated, but easy for the player to manage. There are a few scattered units east of Minsk, but this is the end of Western Front. 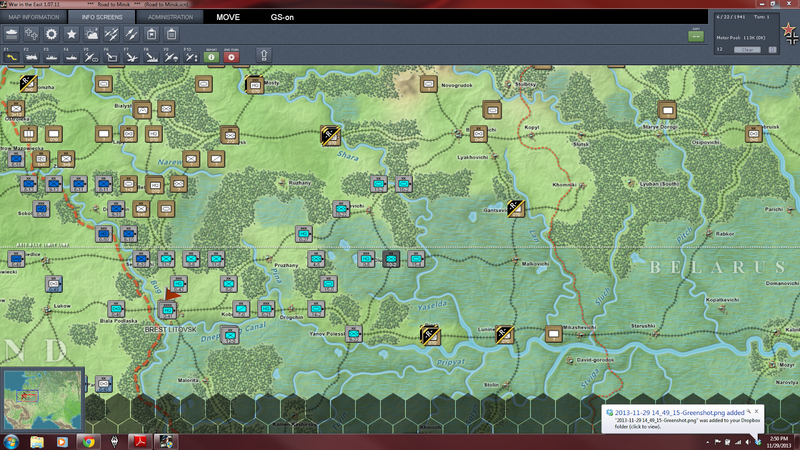 Turn three is really nothing more than mopping up isolated Soviet units and pushing the Panzer divisions to the remaining objectives on the far eastern side of the map. The final situation. 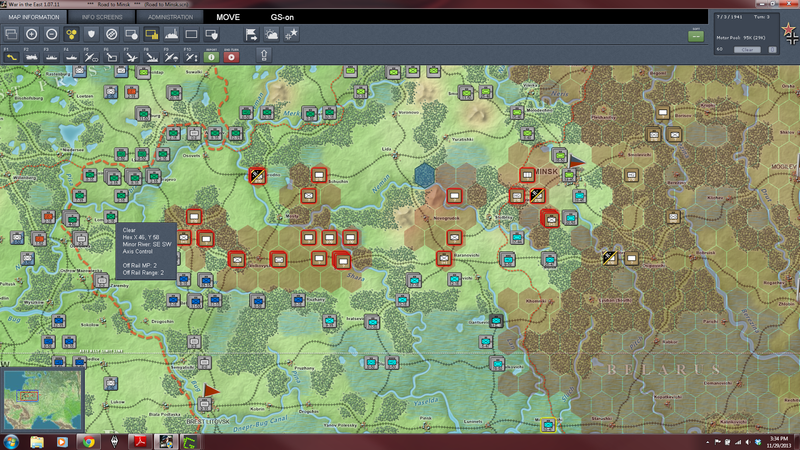 Scoring a Decisive Victory in this scenario isn't a big deal - the scenario description calls it "Blitzkrieg 101" and recommends it as the first scenario to play - more or less an extended tutorial. 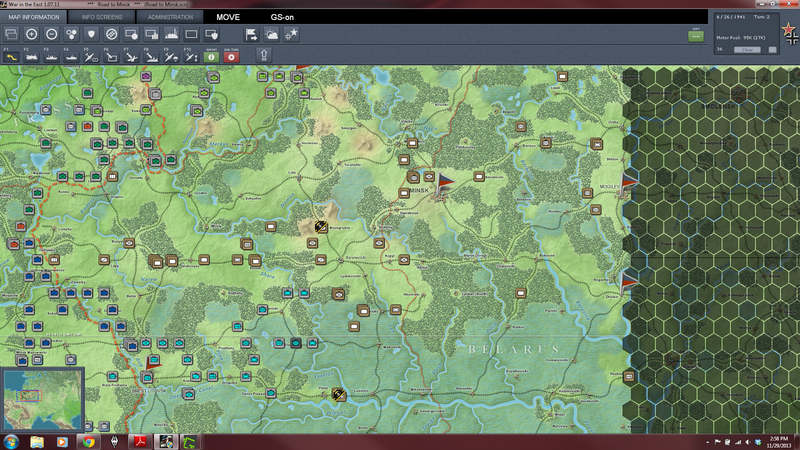 As you can see from the screenshot above, I never even bothered to move 9th Armee (green NATO symbols) any distance from their starting locations to support my spearhead units because there just wasn't any need. The scope of the scenario is such that there's zero chance of even a limited Soviet counter-attack. Still, I was amazed at just how approachable this game is for the player. The UI is well designed. It's generally easy to keep track of things like formations, logistics, and air support. While very detailed, the game can automate a lot of the tedious tasks associated with that detail. While a larger scenario will definitely be a lot more complex to play, and there are definitely aspects and capabilities of the game I never touched on in this scenario, I'm no longer concerned that I won't play it very much. I suspect as I make my way through my stack of books on the Eastern Front this is the primary tool I'll be using to understand the significant operations of the war. Thanks Doug for posting this. I've always wondered. Do you have Decisive campaigns: case blue? And if so, how does it compare? Excellent segue, Chris! I just picked up Case Blue this week during the Matrix sale. I'm going to give the 2nd Kharkov scenario a try today. I also have From Warsaw to Paris and have played it some. I like the game system.